Nitrate occurs naturally in our environment in small amounts. It is typically found in rainwater, streams, and in the groundwater table. As nitrogen is found in all living things, it is not unusual to find deposits throughout nature. The nitrogen cycle is a component of the life-sustaining process and natural nitrate production occurs when bacteria process nitrogen. Nitrate is one of the most soluble forms of nitrogen for plant life. Now that we know plants thrive on nitrates, we can narrow down how unsafe volumes of nitrates enter water supplies. Given the value nitrogen offers to plants of all kinds, fertilizers are the major culprit for tainting supplies of drinking water. Farms, golf courses, and even those pristine neighborhood lawns can all contribute to high nitrate levels in surrounding water sources. Nitrate can be present in fertilizer or can occur as the nitrogen breaks down over time. It can also form as plants and animal waste decomposes. Nitrate has the dubious quality of easily slipping through the soil. This means as the rain falls or the sprinkler sprays, nitrates are quickly working down into the water table. Ideally, no nitrates would enter the supply of water for anyone to consume. There are no health benefits to humans after taking in nitrates, thus we should avoid them entirely. The Safe Water Drinking Act of 1974 set forth standards that demanded states guard water supplies to avoid contamination by dangerous levels of foreign bacteria, chemicals, and substances. Recommendations officially state the limit for nitrates at 10 mg/L. Any volume over this level is considered unsafe and must be dealt with accordingly. Those who source from water supplies with nitrates over this maximum contaminant level should switch to bottled water immediately and avoid consumption. In addition, those experiencing high levels of nitrates should consider their options for a filtering system. However, consumption is the only concern with water over the 10 mg/L limit. Bathing and swimming in water contaminated with nitrates is fine as long as no water enters the mouth. Dishes and clothes can also be washed with the water as long as they are rinsed thoroughly. The primary danger of human consumption of nitrates is the conversion to nitrites. Nitrites have negative impacts on red blood cells and their ability to carry oxygen to the necessary organs. The lack of proper blood flow can lead to a condition called methemoglobinemia, informally known as blue baby syndrome. Methemoglobinemia most commonly occurs in unborn babies, infants, and the elderly who are susceptible to many health problems. Other medical conditions have been potentially caused by nitrate consumption including increased cancer risks and thyroid issues. While there is little research on the subject, it is generally considered dangerous to consume nitrates and should be avoided by all. Do I Have Nitrates in My Water? The inherent dangers of consuming water contaminated with nitrates lead many to be fearful of their water supply. Generally, it is rare for public or private water supplies to feature nitrate levels about the 10 mg/L safety threshold. If you receive water from a municipal source like your city, county, or private vendor contracted by them, requirements are in place for your water to be tested regularly (most often annually). The results must be made available to the public and you can request them any time. If you have a well or some other personal water source, you are responsible for testing the supply for contaminants including nitrates. This can be done by labs certified for water testing and it is recommended that you send a sample of each year. Any water that has shown levels of nitrates above 5 mg/L should be tested each year or several times a year to see if the levels fluctuate. The discovery of nitrates in your water supply could be shocking and frightening, to say the least. There are several methods that can be used to remove nitrates from the water including reverse osmosis, ion exchange filtration, and distillation. Boiling and standard carbon-based filters are not reliable to remove nitrates. Reverse osmosis and ion exchange are the preferred methods for nitrate removal as distillation is neither cost effective or efficient. Reverse osmosis is a form of filtration that forces water through membranes that allow only the smallest molecules to pass. These systems are often installed near the kitchen sink and are quite efficient. Drawbacks are limited but many find the taste of the water unusual given its utter lack of minerals. 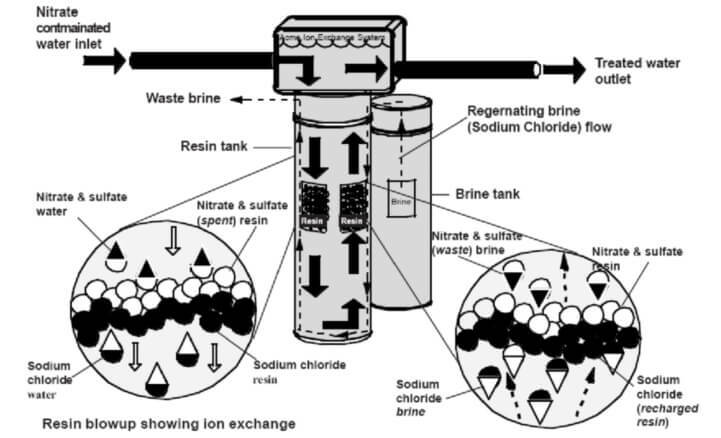 Ion exchange filtration is more cumbersome and labor intensive. It is effective as the filters absorb nitrate and sulfate ions. Filters must be replaced regularly as any buildup of sulfate can prevent proper ion absorption. These systems are installed near the sink or near where the water enters the home. Again, the simplest way to deal with nitrates is to avoid them altogether. If nitrates are entering a private water supply, it is advisable to consider a new supply or bottled water. However, if this proves impossible filtration methods exist to return water to a drinkable state. Nitrate contamination is rare for those who access water from a public source. Regular testing and federal regulation have led to an overall clean water supply. When contamination does occur, either from nearby farms, polluted streams, or other causes, action should be taken immediately to prevent further issues. For those unfortunate enough to have to deal with unsafe nitrate levels or who are overly concerned with water quality, solutions like reverse osmosis and ion exchange can make water safe.